A team of SWAT officers destroyed an innocent man's house during a 19-hour standoff—for the sake of arresting a man who was accused of shoplifting clothes. Leo Lech lost his home in June 2015, after police launched a 19-hour standoff that included the use of armored vehicles, breaching rams, high-caliber rifles, chemical agents, flash-bang grenades and remote-controlled robots. While his home became “collateral damage,” neither Lech nor his family had any ties to the target the officers were pursuing. It all started when a 30-year-old man was accused of shoplifting a shirt and two belts from a local Walmart. Police claim that when they approached Robert Jonathan Seacat, he fled the scene and officers followed him. After he drove to a nearby light rail stop, he abandoned the car he was driving and took shelter in a random house. According to a report from the Denver Post, officers claimed that when they entered the home, “Seacat, who was on an upper floor, fired four or five shots through the floor at officers below.” Police decided to respond to one man barricaded in a home and armed with a handgun by employing 50 SWAT officers and a host of expensive technology, destroying the majority of the home, before they found their suspect in a bathroom and arrested him. “Though accounts of Seacat’s weaponry differ, court documents provide a startling summary of the police arsenal: 50 SWAT officers bombarded Lech’s property with 40 mm rounds, tear gas, flashbang grenades, two armored Bearcats, and breaching rams. A total of ‘68 cold chemical munitions and four hot gas munitions’ were detonated inside the Greenwood Village home. Remote-controlled robots were also used during the raid. The first robot was deployed to track Seacat’s whereabouts inside the house and attempt to deliver a phone to Seacat so that he could directly communicate with police. However, the robot could not maneuver through the debris inside the home, and eventually got stuck. The amount of force and technology police used, in order to arrest a man who was suspected of shoplifting clothes from Walmart is bizarre, but the fact that they seemed intent on practically destroying an innocent man’s home is even worse. 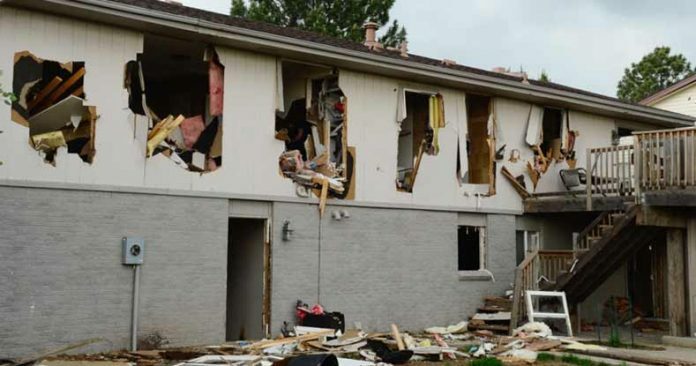 According to the report from Reason, the commanding officer during the raid, Dustin Varney, instructed his team to “take as much of the building as needed, without making the roof fall,” and that is exactly what they did. “They came and they destroyed the house. It was condemned, it had to be torn down, and they offered me $5,000,” Lech told the Denver Post, noting that his son’s family, who was renting the house from him, had all of their personal belongings destroyed, and were never compensated. Although Lech’s house was declared “a complete loss” following the raid, the City of Greenwood Village offered him just $5,000 for temporary living arrangements. In response, he filed a federal lawsuit, claiming civil rights violations, and unjust compensation from the government. Lech told CBS Denver that he expects his case to be heard in federal court in January 2018. He should file personal lawsuits against every member of the police involved. Only when THEY start to pay for their criminal behavior from THEIR OWN POCKETS and not using the taxpayer's money will you see any change. Police officer after it all would say "Wow. We didn't get the shirt and the belt back, but at least it was fun!"